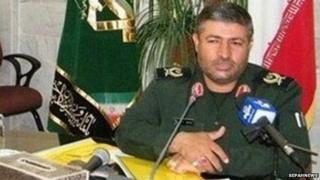 Iran's elite Revolutionary Guards have confirmed that a general was killed in a suspected Israeli air strike in the Syrian Golan Heights on Sunday. Mohammad Ali Allah-Dadi was in Syria to advise forces supporting President Bashar al-Assad, a statement said. The Lebanese Shia Islamist movement Hezbollah said six of its fighters also died when a helicopter fired missiles at a convoy in Quneitra province. Sources in Israel said it was aimed at stopping an attack on Israeli soil. Earlier, a source close to Hezbollah told the AFP news agency that a total of six Iranian soldiers had been killed, along with its own fighters. The official news website of the Revolutionary Guards, Sepahnews, only reported confirmation of Gen Allah-Dadi's death on Monday. It cited a statement as saying he had been "martyred while defending the shrines and innocent people of Syria". It praised the general for his "effective" role in the Iran-Iraq War, as well as his service as commander of the al-Ghadir Corps in Yazd province in central Iran. "The commander was in Syria to provide advice to the nation to confront the Salafist-takfiri terrorists", it added, referring to Sunni extremists. Hezbollah's al-Manar TV said Gen Allah-Dadi and its fighters were killed while inspecting positions in the village of Mazraat Amal, which is an area where the Lebanese group is giving crucial help to Syrian government forces fighting rebels from al-Nusra Front, an al-Qaeda affiliate. The dead included Jihad Mughniyeh, the son of a Hezbollah military chief assassinated in 2008, and Mohammed Issa, a field commander, it added. The BBC's Paul Wood in Beirut says that whatever led up to this incident, the question now is whether Hezbollah retaliates. Only days earlier, its leader Hassan Nasrallah threatened Israel with long-range missiles if it carried out any more strikes on Syrian soil. On the one hand, Hezbollah may not want to open up a second front against Israel while it is so heavily involved in Syria, our correspondent says. On the other hand, many in Lebanon believe Hezbollah will not be able to remain quiet after such senior people were killed, he adds.